Nanook of the North (also known as Nanook of the North: A Story Of Life and Love In the Actual Arctic) is a 1922 silent documentary film by Robert J. Flaherty. In the tradition of what would later be called salvage ethnography, Flaherty captured the struggles of the Inuk Nanook and his family in the Canadian arctic. The film is considered the first feature-length documentary, though Flaherty has been criticized for staging several sequences and thereby distorting the reality of his subjects' lives. In 1989, this film was one of the first 25 films to be selected for preservation in the United States National Film Registry by the Library of Congress as being "culturally, historically, or aesthetically significant". The film was shot near Inukjuak, on Hudson Bay in Arctic Quebec, Canada. Having worked as a prospector and explorer in Arctic Canada among the Inuit, Flaherty was familiar with his subjects and set out to document their lifestyle. Flaherty had shot film in the region prior to this period, but that footage was destroyed in a fire started when Flaherty dropped a cigarette onto the original camera negative (which was highly flammable nitrate stock). Flaherty therefore made Nanook of the North in its place. Funded by French fur company Revillon Frères, the film was shot from August 1920 to August 1921. 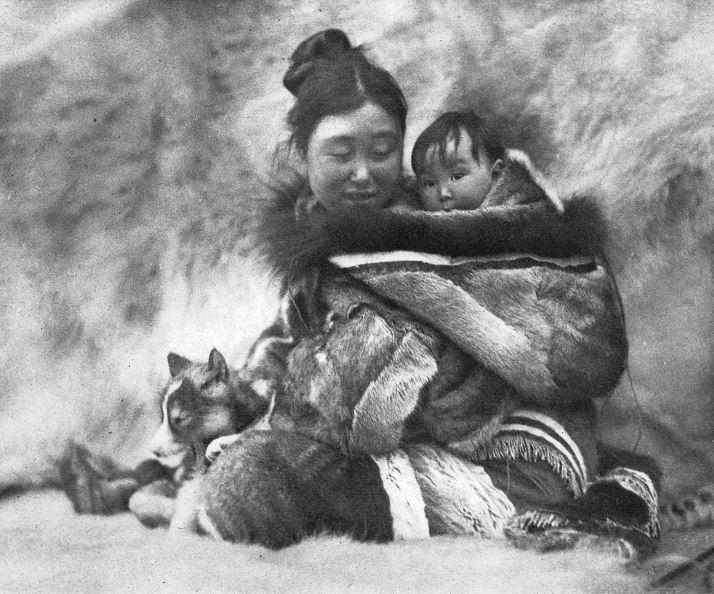 As the first nonfiction work of its scale, Nanook of the North was ground-breaking cinema. It captured an exotic culture (that is, Indigenous and considered exotic to European colonizers) in a remote location, rather than a facsimile of reality using actors and props on a studio set. Traditional Inuit methods of hunting, fishing, igloo-building, and other customs were shown with accuracy, and the compelling story of a man and his family struggling against nature met with great success in North America and abroad. Flaherty has been criticized for deceptively portraying staged events as reality, although staging events for the camera was the norm of documentary filmmakers of the time. "Nanook" was in fact named Allakariallak, while the "wife" shown in the film was not really his wife. According to Charles Nayoumealuk, who was interviewed in Nanook Revisited (1988), "the two women in Nanook - Nyla (Alice [?] Nuvalinga) and Cunayoo (whose real name we do not know) were not Allakariallak's wives, but were in fact common-law wives of Flaherty.” And although Allakariallak normally used a gun when hunting, Flaherty encouraged him to hunt after the fashion of his recent ancestors in order to capture the way the Inuit lived before European influence. On the other hand, while Flaherty made his Inuit actors use spears instead of guns during the walrus and seal hunts, the hunting actually involved wild animals. Flaherty also exaggerated the peril to Inuit hunters with his claim, often repeated, that Allakariallak had died of starvation two years after the film was completed, whereas in fact he died at home, likely of tuberculosis. Flaherty defended his work by stating that a filmmaker must often distort a thing to catch its true spirit. Later filmmakers have pointed out that the only cameras available to Flaherty at the time were both large and immobile, making it impossible to effectively capture most interior shots or unstructured exterior scenes without significantly modifying the environment and subject action. For example, the Inuit crew had to build a special three-walled igloo for Flaherty's bulky camera so that there would be enough light for it to capture interior shots. At the time, few documentaries had been filmed and there was little precedent to guide Flaherty's work. Since Flaherty's time both staging action and attempting to steer documentary action have come to be considered unethical amongst cinéma vérité purists, because they believe such reenactments deceive the audience.